When we carried the notice last week that Lang’s Auctions, Inc. would be selling off items from the estate of esteemed writer, angler and innovator Bernard “Lefty” Kreh, I knew I had to put the dates into my calendar and check it out. I did, and it was an eye-opening event. I grew up around the auction business. From cars and trucks, to estates, houses, and livestock including cattle, horses and the occasional llamas, camels and other zoo critters to used furniture, my family was involved in auctions. The word involved is far more accurate than saying we were interested in them, because for several years, my dad had a small auction house. It was there where I first realized that people can get so into the competition of bidding that their brains seem to close down. That’s how you wind up coming home to try and explain a $75 dollar “bargain” lamp that has a $12 price sticker on its base. You got caught up in the competition rather than keeping a cool head. The Lang’s auction, however, was totally different from the ones of my childhood. This was much more closely related to a Christie’s auction. Great catalog, wonderful illustrations and accurate descriptions of the items offered. The one area where they were wrong was the portion that was so eye-opening: the estimated price ranges for the items. I had an eye on this personal letter from President George H.W. Bush to Kreh. As a fan of both, I thought it a great two-fer, especially at the $100-150 estimated auction price. I didn’t win. A dyed-in-the-wool fan of letters and photographs from famous people, I had my eye on a personal letter from President George H.W. Bush to Kreh thanking Lefty for sending Mr. Bush a copy of “Presenting the Fly”. According to the estimated price range, I felt my $100 bid strong enough to scare off the tire-kickers. Turns out, I was the tire kicker. The photo and accompanying image went for $650. And nearly everything else I’d found interesting shot straight through the estimates, leaving my bids ‘way down on the live bidding lists. My abject failure to get close on anything, quickly had me checking into lure collecting. Turns out I was (again) a victim of my own ignorance. There are several levels of lure collecting – and I was out of my league. A legendary figure like Lefty Kreh didn’t just have significant fishing tackle, he invented a bunch of it. That’s why the “Lefty’s Deceivers” in this auction sold in the hundreds – or higher. And those collections of lures with the hand-drawn “Plate A, B,C, etc” notations were worth so much. They were the lures for the illustrations of the definitive books on the tackle. As I watched the auction rolling along, I realized many of the items weren’t antique- that’s a designation serious collectors only attach to pre-1900 lures. They weren’t the old, rusty, greasy lures left in the bottom of your grandfather’s ancient tackle box, either. These lures were the “heroes” of their genre- the lures kept in pristine condition, accompanied in many cases by their original packaging and in “unfished” condition. They’d been used for catalogs, sent to notable writers (like Kreh) or given to serious collectors. Before this weekend, I don’t know if I’d ever heard of a Musky Charmer. But after this one sold for $21,000, I’m not likely to forget it, Charmer Bait Company, nor the Creek Chub Bait Company of Garrett, Indiana. 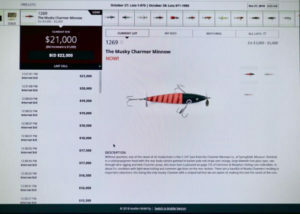 Screenshot from Lang’s auction. Researching over the weekend, I scratched the surface on a whole new category of angling- the lure collectors. The people who can look at an old lure and instantly recognize its parts, paint scheme, and likely year of manufacture. To them, it was about the art of the lure, not its allure to fish. Those were the people participating in this auction -and while I might share their love of all things old and exquisitely made, I lacked the baseline knowledge to know whether or not I was wasting my time bidding. 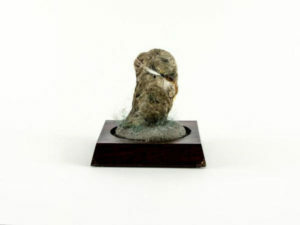 For me, the auction wasn’t about the things being auctioned, it was about my respect for the man who’d owned them last. To me, having something from Lefty would serve as a trigger for my memories of- and admiration for- him. That’s why I was delighted to learn – after the fact- that I hadn’t struck out despite the fact I was fighting out of my weight class. Before the auction had begun, I’d bid on a piece that caught my eye because it didn’t look particularly historic. A mounted Porter Stone Fly (above) with a base (below) that illustrates how revered “Lefty” was among fly fishermen. It will enjoy the same standing in its new home. 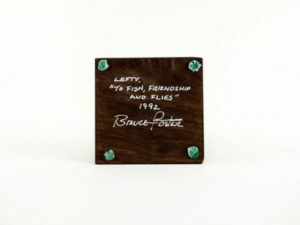 Today, I’m the proud new owner of a “Mounted Porter Shrimp Fly” with a base that reads “Lefty, To Fish, Friendship, and Flies” and signed by its tyer, Bruce Porter. It might not be historic, but it will carry the memory of Lefty from one admirer to another. That’s significant enough for me. This entry was posted in Fly Fishing on November 1, 2018 by ronniegarrison. This smallie whacked a big streamer fished fast in clear water. Statistics show bass being the most sought-after gamefish in the United States. This means there’s not many offerings a largemouth, smallmouth or spotted bass haven’t already seen. From tubes, grubs, spinnerbaits, crankbaits, jerkbaits…whatever, anglers have steadily reeled, dragged and juddered about every lure conceivable past their lateral lines. Ichthyologists verify some fish species are capable of remembering, short term; bass, one of them. Overall, even though there’s no calculus or geometry processing throughout their pea-sized brains, bass are smart. When a bass gets stressed out too many times from getting sore-lipped from, say, a white spinnerbait, chances are that a fish will turn tail next time one goes ripping by. So what are anglers to do when the catching gets tough, especially in waterways with heavy fishing pressure? Give ’em something they don’t often see. But that doesn’t always mean rooting around the bottom of the tackle box in search of the rusty-and-less-than-trusty lure. Backsliding in time to one of the oldest techniques known for fooling fish may just be the ticket. St. Croix’s Mojo Bass Fly was created specifically for hunting bass where conventional casting and spinning gear struggle to operate. 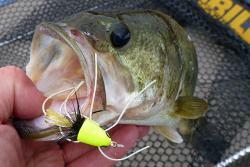 Overall, the flinging of feathers and fur for bass isn’t the dabbling of a tiny topwater-bug. Modern fly-tying materials allow the gurus of the fly tying community to create realistic minnow, crustacean and aquatic insect replications never seen before. And some of the biggest flies can be fished aggressively when it’s called for. Then there are times fly fishing lets you to present an offering in ways standard spinning and casting gear can’t. And, frequently, the practice will outperform standard techniques. I first met Russ Maddin on the banks of a river near my hometown of Traverse City, Michigan, about 25 years ago. The fly angler extraordinaire was casting and testing-out huge streamers newly designed and tied. Little did I realize I was observing the beginning of the big streamer revolution for behemoth trout. I also didn’t envision these big streamers would someday be crossing the line, becoming staple for catching big bass. While the tried-and-true streamers like 3- and 4-inch Clouser Deep Minnows still fool bass, many of todays articulated flies, like the Circus Peanut, and others such as the Flash Monkey and Murdich Minnow, measure out to 5- to 6-inches or more. And they have a swimming action that rivals the best jointed bodybaits and jerkbaits. To boot, unlike plastic or balsa baits, the soft synthetic and feathery materials never quit moving, pulsating even if the fly’s sitting stationary. Streamers rule when fished at high speed; the hustle generating strikes. Love catchin’ bass on a topwater lure? Who doesn’t? And the attack from a bass as it throttles a big topwater bug is just as exhilarating. Big poppers are a standard; have been since day one. And, they can often be fished in areas other lures can’t. Most bass flies are tied on big, single hooks. Add a strand of heavy monofilament over that to surround the point and you’ve got yourself one heck of a snag-proof presentation that even the thickest lily pad or milfoil bed can’t grab hold of. Streamer on a Bank robber top; bid deer hair popper on a Mojo Bass Fly underneath; “fluffy flies” in between the reels. These are all a bass angler needs to fool big bass on a fly rod. Then there are the subsurface flies, which dive mere inches under the surface, such as the Dahlberg Diver and Umpqua Swimming Baitfish. These patterns work wonders when young-of-the-year fishes are eating immerging bugs, and the bass are targeting the fish rather than the insects. One retrieve is to recover line so the diving fly dips under the surface for a few feet, and then give it a pause. This imitates a small fish swimming about and stopping to eat bugs. But don’t let this be your only technique. Steady retrieves are always worth a try. Fly fishing is severely overlooked by lake-bound bass anglers. Consider that June-ish period when your sonar absolutely clogs with clutter. Those zillions of tiny specks on my Humminbird ONIX signify mayfly nymphs waggling their way from the bottom. This is where smaller “jigging flies” come into play. These are tied with heaps of marabou-like feathers, which undulate non-stop like a nymph’s gills, and tied with weighted eyes so they waft ever so slowly down through the water column. Work them slowly on or near bottom with a stop-and-go, and hang on. Back in the day, my father would hook a night crawler mid-point (known today as wacky rigging), lob it out into the drink and let it fall like a feather. Needless to say, he out-fished everyone. Wacky rig a do-nothing-type worm and you’ll get the same results. I tried something similar just last year, nose-nipping a Custom Jigs & Spins’ Pulse-R Paddletail, with a size-6 octopus-style hook with no additional weight. The results? The ultra-slow fall was too tantalizing for smallmouth to pass up. Cast the same rig on conventional gear and the bait wouldn’t make it three feet past the tip. But with the right fly rod, the offering can be cast 100 feet or more. And the clearer the water, the further your cast needs to be. Surface poppers, fished-on-the-fly, make even average sized bass feel like a diesel on duallies. Today’s fly rods are becoming as technique-specific as standard spinning gear. Maddin’s into casting shorter sticks as of late, with lengths under 8 feet slowly taking over his arsenal. Because of his fixation with the short rod, I opted to try out St. Croix’s new 7-foot 11-inch Mojo Bass Fly; which is within bass tournament regulations, being under 8 feet. If you’re not sold on short rods yet, St. Croix’s 9-foot Bank Robber series (VIDEO)—which was designed for casting big streamers by fly guru Kelly Galloup—also works wonders for topwater and slow-falling flies. The most versatile fly rod for bass catchin’ is a 7 or 8 weight. As for lines, it’s best to have three reels or a couple extra spools filled with different types. A weight-forward floating line is needed for topwater, an intermediate sinking line for slow falling flies, and sinking line for streamers and the like. Fly fishing for bass is not the dainty dabbling of tiny flies many think it is. Big streamers fished aggressively will rock a bass angler’s world; topwater is still exhilarating; and the slow-fall will catch fish during the most difficult conditions. David A. Rose is writer, photographer and fishing guide who lives near Traverse City, Michigan. This entry was posted in Bass Fishing, Fly Fishing on May 12, 2016 by ronniegarrison. This largemouth was caught on an Eelworm Streamer, which is the fly-fisher’s alternative to a rubber worm. Think of fly-fishing and you automatically think of trout. 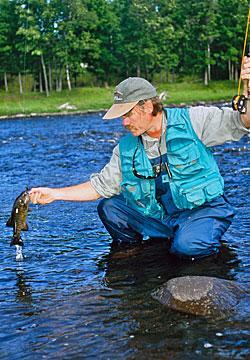 Fly-fishing is ideally suited to presenting tiny flies that imitate a lot of what a trout eats. But fly-fishing can be a challenging technique for targeting bass, too. And most of us have a pond or lake close by that has bass in it so they’re readily available and we don’t have to travel far to find good fishing. Most anglers pursue bass with a spinning rod or bait-casting gear from the deck of a bass boat like the anglers they see on Saturday mornings. 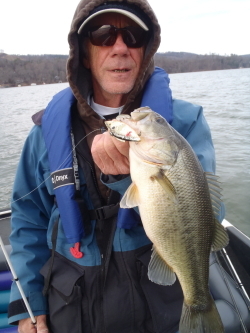 But there are more and more anglers trying the long rod for bass and they’re finding it both challenging and rewarding. With fly gear, you’re certainly not going to hoist a 5-pound bass into the boat and you’re going to have to fight it more than 30 seconds. An extended fight alone might be the real attraction. The explosion in fly tying materials in recent years has fostered even more realistic flies, many intended for bass. The real interest in fly-fishing for bass got started in the 1980’s jumpstarted by two legends in the fishing world. Oklahoman Dave Whitlock was one of the first to design flies specifically for warm-water species and extolled the joys of fly-fishing for bass. Whitlock was a master fly tier, artist, author and fly-fishing innovator who eventually transplanted to Arkansas to be close to the White River and its fabulous trout fishing, but he never forgot about bass. Whitlock’s innovative designs included the Eelworm Streamer, which was the fly rodder’s equivalent to the bass fisherman’s plastic worm. With heavy lead dumbbell eyes, the fly exhibited a nose-down attitude that mimicked the classic rubber worm, but with undulating feathers and mottled tones the Eelworm Streamer looked more life-like than any piece of plastic. Whitlock continued to create bass flies that covered everything from top to bottom. 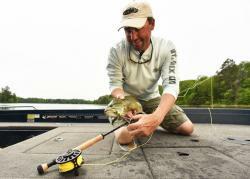 Flies like the Hare Water Pup, Wiggle-Legs Frog, Dragon Flies and Sheep Minnows that look more real than any crankbait. Bass are more opportunistic than trout. Most times there’s no need to match-the-hatch when fly fishing for bass, but Whitlock’s designs opened the eyes of fly fishers who had their sights set on bass and had come from a trout fishing background. Although many of Whitlock’s flies appealed to both largemouth and smallmouth bass, his flies had a particular bucketmouth appeal. 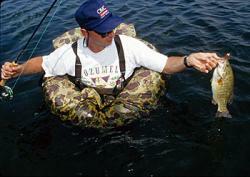 Kicking around in a float tube is a great way to target bass with a fly rod. Larry Dahlberg grew up fishing and guiding on the St. Croix River on the Minnesota/Wisconsin border. Dahlberg was so infatuated with fishing that by the time his friends were bagging groceries at the local supermarket, he was guiding anglers on the river for good money, most with a fly rod. Dahlberg, like Whitlock, was an innovator and inventor and went about designing flies that would catch his clients more fish. One of his creations, the Dahlberg Diver, was fly-fishing’s answer to the bass fishermen’s crankbait. The Dahlberg Diver has a cone-shaped head made of spun deer hair with a stiff collar. The idea was that when stripped hard, the cone-shaped head would act like a lip on a crankbait causing the fly to dive. The harder and more you stripped, the deeper the fly would dive. Stop stripping and the fly would swim back to the surface. It’s a triggering mechanism that most predators can’t stand. The Dahlberg Diver proved to be a killer on not only St. Croix River smallmouths, but also sizable pike and muskies. Dahlberg also tied life-like poppers and sliders that catch plenty of bass even today. The explosion in fly tying materials in recent years has fostered even more realistic flies, many intended for bass. With a variety of synthetic furs, rabbit strips, Krystal Flash and rubber legs, pinchers and feelers, bass flies look like the real thing. Made from natural materials or synthetics, bass flies not only look real, they feel natural. 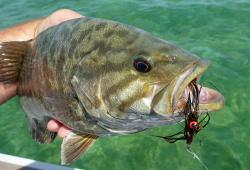 When a bass chomps on a hair mouse or frog, it feels natural so that fish is less likely to let go. Undulating feathers or quivering rubber legs gives bass flies an added realism that cannot be duplicated with conventional hard baits. Many rivers have outstanding smallmouth populations and targeting them in the summer with the long rod can be great fun. What kind of fly rod you choose for bass fishing depends on which kind of bass you intend to fish for. Largemouths tend to inhabit thick cover where a heavier rod can be an advantage for muscling big bass. The flies that are used to entice largemouth bass are generally larger and bulkier and more easily cast with an 8- or 9-weight fly rod. Smallmouths frequent more open structure where rocks or wood are the main habitat. Nymphs, streamers and bugs that trigger strikes from smallmouths can be easily cast with a 6-weight fly rod. The reel is relatively unimportant and is used mainly for line storage. Bass don’t run so an intricate drag system is not necessary. Unlike when casting a lure with a spinning or bait-casting rod, when fly-fishing the line carries the lure or fly not the other way around. To throw bulky, wind-resistant frogs or poppers requires a weight-forward or bass-bug tapered line. A line like this is heavier at the forward end and is better suited to driving out-sized bugs that require more power to cast. Match the line weight to the rod. Leaders need to be nothing more than a four-foot length of 20-pound fluorocarbon when fishing largemouths. A tapered leader of no more the 7-1/2 feet is perfect for smallmouths. Late spring and summer is primetime for fly-fishing for bass. Bass are most susceptible to fly-rod tactics when they are in the shallows. Actively spawning bass are suckers for flies twitched around beds. I’ve caught dozens of largemouths and smallmouths on rubber spiders intended for bluegills. A good pair of polarized glasses will help you spot active beds and spawning bass. This can be done from the front deck of a bass boat or out of a float tube. Fly-rodding for bass is hot during the heat of summer. Bass take up residence in predictable locations during the summer and fly fishers can capitalize. Working minnow imitations along weed edges can be a great tactic for scoring on summer largemouths. One of many bass the author has caught on a sponge spider intended for panfish. Largemouths will also take up residence under mats of floating vegetation to avoid the hot sun and jet skis. Lily pads and largemouths are like peanut butter and jelly. Frogs, Divers and bugs tied with monofilament weed guards can be cast into the thickest junk without fear of getting hung up. Dropping a hair frog into the opening between pads and then causing it to twitch and skitter will bring explosive strikes from resident bass. Many times the best action is during the heat of the day. Smallmouth thrive in cool, clear lakes and can be targeted by fly fishers with life-like imitations that simulate smallmouth fare like crayfish, minnows and gobies. 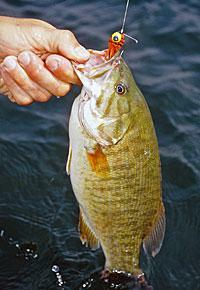 In large cool bodies of water smallmouths may not spawn until July, so you’ll find them still patrolling the shallows. During the post spawn, you’ll find male bass protecting the beds. Look a little deeper for the rotund females. Many rivers have outstanding smallmouth populations and targeting them in the summer with the long rod can be great fun. As water levels drop in the summer time bass will be highly concentrated on the pools and deeper runs. Bass will move into riffles to feed or in slack-water areas to root out crayfish. 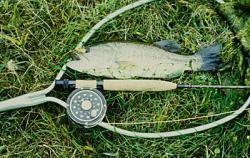 Fly-fishing for smallmouth in rivers is a lot like fly-fishing for trout. Many of the same nymphs, Wooly Buggers, Muddler Minnows that catch trout will catch smallies. There may even be times when hatches of aquatic insects will bring smallmouths to the surface like trout. Streams and rivers become tepid during the summer months so wading wet is an option. You can use a canoe to cover water and then get out and fish the best pools and runs. Tangling with a 3 or 4-pound bulldogging smallie on the long rod is a hoot. This entry was posted in Bass Fishing, Fly Fishing, How To Fish on May 4, 2015 by ronniegarrison. Can I Learn To Fly Fish? As a pre-teen, outdoor magazines exposed me to wonderful fishing experiences I could only dream about. Growing up on a small farm in rural McDuffie County, I was familiar with bream and bass, but catching trout and salmon was a thrilling idea. And my cane pole paled in comparison with fly rods and the whole mystic of fly fishing. I tried to imitate what I read. I would take the smallest bream hook I could find, some of mom’s sewing thread, and a few chicken feathers and tie flies. In my mind they were masterful creations that sometimes fooled small bream and horny head creek minnows in Dearing Branch. My “fly rod” was a short end of a broken cane pole and my fly line was any kind of fishing line I could find. I spent many wonderful hours dabbling those home-made flies in the branch, trying to catch anything that would hit. When I was in high school I got a real fly rod for Christmas – a generic rod with a spring loaded reel. I loaded it with cheap fly line and had fun catching bluegill on little popping bugs and bass on bigger bugs. I also used it like a cane pole, with cork and jig, for catching crappie around button bushes at Clark’s Hill in the spring. After we got married, Linda and I fished a lot. I told her a fly rod was too hard to learn to use but she insisted on trying it one day, and within minutes she was putting the little rubber spider near bushes and landing bluegill. She was hooked, and I had to buy her a fly outfit of her own the next week so I could get mine back! Fishing with a fly rod is different because you cast the line, not the tiny, light-weight lures used in fly fishing. You can fish a fly the size of a gnat, if you can see well enough to get the line through the eye of the hook, and catch fish that won’t hit anything else. But for fishing around here you don’t need fancy gear and tiny flies. You can get a cheap fly rod and reel like the first one I used for about $25 locally at Berrys Sporting Goods. For a decent line, the most important part of the outfit, you will spend about $15. That will get you started, or you can go with a good outfit that will serve you for many kinds of fishing for under $100. Add a few rubber spiders, popping flies for bluegill and big popping bugs for bass and you are ready to fish. When you start using your fly rod, you will want a lot of room behind you for the back cast. For that reason, fishing from a boat or fishing a pond where you can wade out from the bank is best. As you learn to use your outfit better and learn to do roll cast you can fish tighter spots without catching a lot of limbs. The Flint River is a great place to use a fly rod. You can fish from a canoe or jon boat or wade the shoals. Cast a hellgrammite (rock worm) imitation into pools and shoal bass will give you a fight with lots of jumping. They are the closest thing to smallmouth we have in this area. There are some grown bluegill, pumpkin seed, and shellcracker sunfish in the river that will eat your rubber crickets and popping bugs, too. High Falls is another good place to fish with fly outfits, but you need a boat. The lake is full of bluegill that will readily eat just about any bug you cast to them, and you will hook a bass that will stretch your string when they hit. Big lakes can be fun, too. Jackson Lake has lots of bluegill in the coves around logs and brush, and you can catch all you want on a rubber spider. You definitely need a boat to access the bigger lakes but you will catch fish. Most of the fish in bigger lakes have never seen a rubber spider or popping bug so they are easier to catch. Don’t be frightened by fly fishing. Give it a try and you may be hooked for life. This entry was posted in Fly Fishing on December 20, 2013 by ronniegarrison. 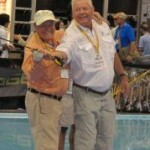 Lefty Kreh at ICast. J.R. Absher photo. From The Fishing Wire Editor’s Note: During ICAST, Etta Pettijohn, J.R. Absher and I received a rare treat: nearly 90 uninterrupted minutes of conversation with “Lefty” Kreh. While J.R. and I were fortunate enough to be interlopers, Etta’s telling of the story allows you to share the conversation as well. Enjoy! Many Outdoor Wire readers know Bernard “Lefty” Kreh as the legendary man who changed the fly fishing world with his casting techniques, and as the man who taught countless anglers to fish for saltwater species on TV and through his newspaper and magazine articles and books. He invented a saltwater fly called “Lefty’s Deceiver,” which is so famous that no saltwater fly box is without one, and the U.S. Postal Service has featured it on a stamp. He has been inducted into three fishing halls of fame. 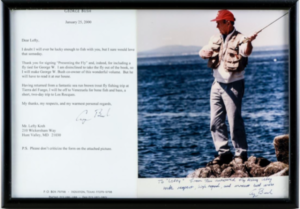 Kreh has fished with the likes of Ernest Hemingway, Fidel Castro, baseball great Ted Williams, singer Huey Lewis, broadcaster Tom Brokaw, several presidents and many dignitaries, to name a few. He is largely responsible for the development of modern light-tackle, big game fly fishing, and his name is revered among fly anglers across the globe. He has spent an impressive number of decades as a journalist for the St. Petersburg Times, Baltimore Sun, and other publications. But there is much more to this unpretentious man with a perpetual smile and quick joke. “My mother was a proud woman,” said Kreh. “But she had no choice.” He said some childhood friends in the ghetto nicknamed him “Lefty” because he played sports left-handed. “When I became a teenager my mother told me I could go to high school if I could find a way to make money for clothes and shoes,” said Kreh. He found a way – fishing a nearby river, limb-lining for catfish. “At night I’d push myself along the bushes on a makeshift pole boat, using a coal oil lantern for light. I sold catfish at the local market for 10 cents a pound, and I was a ‘fat cat,'” he laughed. Kreh speaks proudly about his brothers and sister, who all went on to achieve remarkable success in their lives and careers. When WWII was underway he volunteered to serve at 17 years of age. He ended up as a forward observer in the Battle of the Bulge and was at the Elbe River in Germany where the Russian and Americans first joined together to drive back the Nazis. Along the way his unit, the U.S. Army’s 69th Artillery Division, earned the distinction of being tough, as he and his comrades liberated a concentration camp, fighting battles pivotal to the allied victory. After returning to the U.S. he, in his own words, marked his greatest achievement, by marrying Evelyn, his wife and best friend for more than 60 years. They had two children together and Kreh said above all they were best friends. She passed away in 2011. In 1948 Kreh worked at Fort Detrick, where the military kept biological weapons like Anthrax. When his biohazard suit leaked and he was hospitalized, Kreh spent a month in isolation for exposure to the deadly virus, and today there is a strain named for him, called BVK-1. In 2011, after terrorists attacked the World Trade Center and the Pentagon, killing about 3,000 people in one day, someone mailed the Anthrax virus to a newspaper publisher in Florida and others, proving fatal. At that time the New York Times wrote an article mentioning Kreh as the only person to have survived such exposure. Kreh talks about how World War II drastically changed the U.S. culture. He liked to fish, and secured a job as an outdoor columnist for his local newspaper, and a few years later was syndicated in almost a dozen newspapers. His marksmanship abilities led to a Remington Arms Company contract as a shooting showman, when he would routinely shoot an aspirin out of the air at events and promotions. In 1947, Joe Brooks, the fishing editor for Outdoor Life, brought his fly rod to fish for bass with Kreh in a nearby fishery. Brooks pulled in as many bass as Kreh, who was using a plug-casting outfit, turning Lefty to fly fishing for good. “I was hooked,” he admits. The next decade he began experimenting with flies for striped bass in saltwater, and thus invented Lefty’s Deceiver, a big heavy lure for long casts. In addition, his reporting in magazine and newspapers, about saltwater fly fishing was turning millions of people onto the relatively new sport that was traditionally achieved with baitcasting equipment. Indeed, his instructional writing and casting lessons are what have led many thousands to pick up their first fly rod, as he makes it less mysterious to the novice. He’s been doing it for decades, but every minute of one-on-one instruction from Kreh makes you a better fisherman- and person. J.R. Absher photo. In 1950, five days after the U.S. sanctioned Cuban government fell to revolutionaries led by Fidel Castro, Lefty said he went fishing with the Cuban leader. “Good writing cannot be edited,” Hemingway answered. Kreh continues to travel, giving casting seminars and promoting water and fish species conservation. He represents many tackle companies and has equipment named after him. 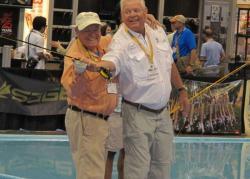 Despite his advanced age, Kreh is always willing to stop and show someone at a trade show his casting technique, or share his life story with an admirer. And there always seems to be a long line of such admirers wherever you find Lefty. One can’t spend time with Kreh without laughing, listening and admiring the man. Indeed his life looms large, like title of his autobiography, and if kindness, brilliance, attitude and achievement count, his life is tantamount to a world record. This entry was posted in Fly Fishing on August 13, 2013 by ronniegarrison.